While all injuries from sports and accidents can be uncomfortable, some require greater care than others. Two of the most common injuries are strains and sprains. Often confused, the two are actually quite different in the way they affect the body. Sprains most often result from the stretching or tearing of the ligament, the tissue that connects the bones and supports the body’s joints. Sprains are most likely to occur after a joint is overstretched or from a fall or hit to the body. Sprains typically affect the wrists, ankles, or knees. Although they range from mild to severe, they’re almost always more serious than a strain. Sprain symptoms typically include soreness, swelling, bruising, and difficulty moving the affected joint. Unlike a sprain, strains are most likely to occur in the neck, thigh, or lower back area. Strains usually occur from a severe stretch or tear of the muscles or tendons, the tissue that connects the muscle to the bone. Symptoms of a strain usually include soreness, swelling, muscle spasm, and difficulty moving the affected muscle. Broken bones or fractures, although common, are more serious than a strain or sprain. Often resulting from a sports injury, accident, or other trauma, broken bones are not typically life threatening, although they do require immediate medical care. These signs usually make breaks or fractures easy to detect. Sometimes, however, the signs can be delayed in appearance. Even if the victim is able to move the affected area, this does not rule out a possible break. Most victims will require x-rays to confirm whether or not the bone is actually fractured. X-rays will also help the doctor determine the type and seriousness of a break so that appropriate treatment can be administered. Often what appears to be a broken bone is actually a dislocated joint. 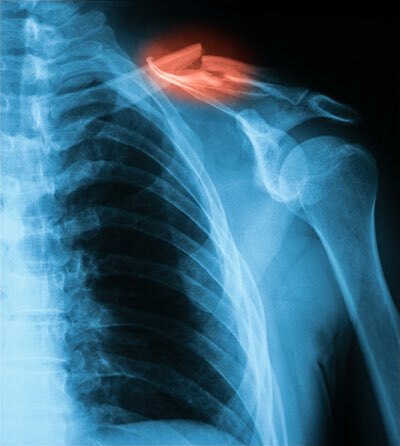 Although just as serious as a break, dislocations require different treatment. Therefore, it’s important to get a proper diagnosis from your nearest MD Now Urgent Care. Our doctor will ensure that you’re properly evaluated and receive the necessary medical attention and appropriate treatment. Most broken bones or fractures will also require a cast or brace. Since fractures commonly result in swelling, these may be treated first with splints. This allows the swelling to go down before placing the broken limb into a cast. Regardless of whether your doctor recommends a splint, cast, or brace, the goal will be to hold the bone in place so that it heals in the correct position. The healing process may take up to several months. Although the cast or brace will be worn the entire time, adjustments may be needed as the bone begins to heal, or if the cast wears out and no longer provides proper stabilization. In cases involving more extreme breaks or fractures, pins, screws, or even surgery may be required. For these reasons, it’s important to have any injury evaluated by a qualified physician. An MD Now Urgent Care doctor is almost always on site and will determine the seriousness of an injury before recommending appropriate care.